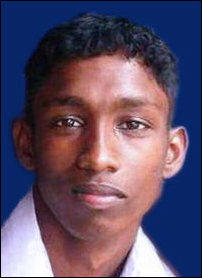 A 18-year-old man from Kokkuvil Hindu College, Senthuran Rajeswaran, born on 18th September 1997, widely believe as a very close associates of the LTTE Tamil terrorists and pro-separatist diaspora student leader from Koappaay North, went ahead with suicide mission of his life Thursday morning by jumping in front of a speeding train at Kokkuvil junction for the sake LTTE terrorists and Tamil terrorism. His body was found torn into pieces in school uniform and police and Army intelligence officers are investigating his association of re-activation of LTTE Tamil terrorism again in Sri Lanka. Pro-LTTE Tamil terrorists’ students at the University of Jaffna launched violence demonstration soon after the suicide mission completed by Senthuran Rajeswaran as to looks like a pre-planned mission. It is common culture in the Tamil communities to perform a suicide mission for every pretty things like dead of a film stars, politicians and even for popular a sportspersons. This is true but HIDDEN by the media. True but ONLY applies to “low caste” Tamils like Senthu. When MGR died many low caste Tamils were FORCED to commit suicide. About 140 of them did. Jaffna Tamil culture is a DEATH CULT much like ISIS. This means the 2 will join forces as they did with the SUICIDE BOMBER TECHNOLOGY. Why no make the most of the life by enjoying and satisfying what you have at present. What a miserable fate waiting for this foolish soul. Those who commit suicide are ending up in “Niraya” and subject to more severe suffering than those who killed others. Who bihind this suicide soon every will know ! One good outcome for re starting trains to the north. One less LTTE supporter. These Tamil youths are utter edits, who can be manipulated to do anything, including suicide. This is the Tamil mentality and that’s why Prabhakaran exploited it to the max. In my opinion, this is no accident but another LTTE ploy to get the international attention. I have no respect for those Tamils who scarify their own kind for selfish motives. They are no any different from those Islamic ISIS Jihadist who massacre their own kind..
What a sad situation. Whether it was really suicide or murder can only be proved by thorough investigations. The suicide culture comes from Tamil Nadu Dalit practices. Also the practice of animal sacrifice. The low values on life come from low self esteem forced on the Dalit population of Tamil Nadu and elsewhere in India now ongoing for some 3,000 yrs. That is why Dalits flee Tamil Nadu and other places in India. Because of all this, Nepal has problems similar to Lanka. Nepal too is a Buddhist country. The Buddha said “one is high born or low born only through one’s actions, and not by birth”. The Caste system states otherwise i.e. that one is born into lowly status. As we in the 21st century can see, this is not true. To Dalits of India, countries without such a caste system are very attractive. But they seem to carry this stigma around with them if they remain in the Hindu religion, even outside of Tamil Nadu and India. It was the Tamil Dalits who were brought across to Lanka by the British & the Dutch to work in the various plantations, tea especially. However sympathetic Lankans may be toward Tamils of Dalit descent, the fact remains that this vulnerable group is used by Tamil leaders and outsiders for divisive and other negative purposes. We welcome the idea of Sri Lanka opening an Institute for Indian Studies, even at this absurdly late stage of events here. It appears that we are losing the door long after the horses have fled, and irreparable damage done to Lanka. This entry was posted on Friday, November 27th, 2015. You can follow any responses to this entry through the RSS 2.0 feed. You can skip to the end and leave a response. Who is this powerful politician? 2019 අප්‍රේල් මස 23 වෙනි බඳාදා, විපක්‍ෂ නායක මහින්ද රාජපක්‍ෂ මහතා පාස්කු ඉරිදා ත්‍රස්තවාදී ප්‍රහාරය ගැන පාර්ලිමේන්තුවේදී කළ විශේෂ ප්‍රකාශය. Dilrook on අග්‍රාමාත්‍ය රනිල් සහ අමාත්‍යවරුන් වන මංගල සමරවීර සහ රාජිත සේනාරත්න බුද්ධි අංශ සහ ආරක්ෂක අංශ දුර්වල කරමින්, සහජීවනයේ නාමයෙන් මෙම ත්‍රස්තවාදීන්ට නිදහසේ කටයුතු කිරීමට පරිසරය සැකසුවේය.